If you didn't already have Brexit fatigue, then according to DB's Craid Nicol Tuesday should test that threshold with PM May likely to attempt to pass another version of the Withdrawal Agreement ahead of the EU Summit later in the week. That should overshadow the BoE meeting; however, we also have a critical Fed meeting to look forward to prior to that. As for data, the flash global PMIs at the end of the week are the easy highlight. As Nicol details, it's hard to look past Brexit as once again being the focal point for markets in the week ahead. Given that the situation remains incredibly fluid it's hard to preview what will or won't happen with much confidence at the moment beyond a short time frame; however, as it stands right now following developments in the last few days, it looks likely that PM May will bring the third version of the Withdrawal Agreement to Parliament on Tuesday ahead of the EU Summit on Thursday and Friday. Should May fail, then the EU will likely insist on a long extension and then we'll move straight to indicative votes or May will try for a fourth time first. Much could depend on how the DUP position themselves with suggestions that they are engaging with the government in the last few days to see how they can back the Withdrawal Agreement. So expect the situation to remain incredibly fluid again over the next few days. Outside of politics, the Fed meeting on Wednesday will garner the usual focus. No change in policy is expected and the meeting should reinforce the message that the Fed will remain patient for now. That being said, our economists believe that there are two key topics that market participants should focus on. The first is any signals about the timeline for ending the Fed’s balance sheet unwind and the second is any insights into the conditions needed to drop their patient guidance and possibly raise rates again later in 2019. On the former, while an announcement of the date for stabilizing the SOMA portfolio is possible next week, we now think it is more likely at the May FOMC meeting. On the latter, Powell should maintain significant flexibility while likely reiterating that a dissipation of the crosscurrents, evidence of continued above-potential growth, and higher inflation are all likely preconditions for another rate increase this cycle. Meanwhile, the data highlight next week comes on Thursday when we get the flash March PMIs around the globe. A reminder that last month in Europe we saw the manufacturing print slide below 50 for the first time in nearly 6 years to 49.3 for the Euro Area. That also confirmed declines in 13 out of the last 14 months after peaking at 60.6 in December 2017. The consensus expects another below 50 print at 49.5, albeit one which would at least signal that we've potentially hit the lows. In contrast, the services sector picked up last month with the Euro Area reading up from 51.2 to 52.8. The consensus expects a small pullback to 52.5. So expect there to be a continued focus on the services versus manufacturing divergence. In the US, the consensus expects the manufacturing PMI to jump 1pt to 54.0 and the services PMI to jump 0.5pts to 56.5. We also have a BoE meeting on Thursday. No change in policy is expected at this either and it's hard to see it as being much of a game changer given the current stage of the Brexit process. That said, it'll be interesting to hear any comments around what has been generally better economic data in recent weeks. We should note that it's a fairly busy week for data next week in the UK with the January/February employment data due on Tuesday, February CPI/RPI/PPI due on Wednesday, and February retail sales and public sector net borrowing data due on Thursday before the BoE meeting. As for the remaining data next week, in the US we have final January durable and capital goods orders as well as January factory orders data on Tuesday. Thursday will also see the latest claims data as well as the Philadelphia Fed business outlook for March which will be worth watching. The February monthly budget statement is due on Thursday. Meanwhile in Europe, we'll get the March ZEW survey in Germany on Tuesday and the March consumer confidence print for the Euro Area on Thursday. In Asia, it's fairly quiet next week for data with only the February CPI report in Japan late Thursday evening worth flagging. As for other things to watch out for next week, on Tuesday, Brazil President Bolsonaro is due to meet President Trump at the White House. On Thursday, China President Xi Jinping travels to Italy where he is expected to sign a framework agreement with PM Conte on the Belt and Road Initiative infrastructure project. Finally, on Friday the Fed's Bostic is due to speak in San Francisco. Monday: A quiet start to the week with the only data due being the March Rightmove house price index reading in the UK, January industrial production in Japan, the January trade balance for the Euro Area and the March NAHB housing market index reading in the US. Tuesday: The possibility of UK PM May bringing a 3rd version of the Brexit Withdrawal Agreement to Parliament will likely be the highlight. As for data, we'll get the January/February employment report in the UK, Q4 labour costs for the Euro Area and the March ZEW survey for Germany in the morning. In the US, final January durable and capital goods orders revisions, and January factory orders are due. Late evening we'll get BoJ minutes from the January meeting. Away from that Brazil President Bolsonaro will meet with President Trump at the White House. Wednesday: All eyes will be on the Fed meeting in the evening. Prior to that, the only data due out is the February PPI reading in Germany and February CPI/RPI/ PPI in the UK. Thursday: Brexit should dominate proceedings again as the two-day EU Council meeting kicks off in Brussels. The BoE policy decision is also due, while China President Xi Jinping is due to visit Italy and meet with PM Conte on the Belt and Road initiative. As for data, we'll get February retail sales and public sector net borrowing data in the UK, March consumer confidence reading for the Euro Area and March Philly Fed PMI, initial jobless claims and February leading index all in the US. Late evening, we'll also get February CPI in Japan. Friday: The flash March PMIs in Japan, Europe and the US highlight data releases on Friday. Other than that, we'll get January wholesale inventories, February existing home sales and February monthly budget statement. Away from that, Atlanta Fed President Raphael Bostic will speak at the San Francisco Fed’s Macroeconomics and Monetary Policy Conference. 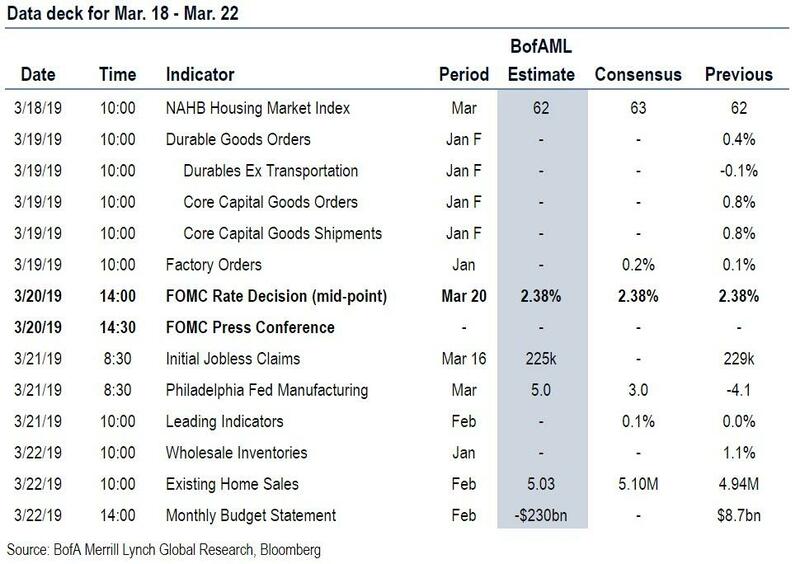 Finally, here is Goldman's take on the key US events this week, where the key economic data release this week is the Philly Fed manufacturing report on Thursday. In addition, the March FOMC statement will be released on Wednesday at 2:00 PM ET, followed by Chairman Powell’s press conference at 2:30 PM. 10:00 AM Factory Orders, January (GS -0.1%, consensus +0.3%, last +0.1%); Durable goods orders, January final (last +0.4%); Durable goods orders ex-transportation, January final (last -0.1%); Core capital goods orders, January final (last +0.8%); Core capital goods shipments, January final (last +0.8%): We estimate factory orders decreased 0.1% in January following a 0.1% increase in December. Durable goods orders increased in the January advance report, driven primarily by an increase in aircraft orders. 02:00 PM FOMC statement, March 19-20 meeting: As discussed in our FOMC preview, we do not expect any change in the funds rate. Faced with tighter financial conditions and a deteriorating growth outlook, the Committee pivoted sharply and ultimately dropped its hiking bias entirely in January. Moreover, the reaction function has gradually become more dovish as Fed officials have increasingly focused less on upside than on downside inflation risks. In the March statement, we expect the Committee to downgrade the characterization of growth (to “moderate”) and job gains. We expect the FOMC to announce that balance sheet runoff will conclude at the end of Q3 or in Q4. The size of the balance sheet will then likely be held constant for some period to gradually reduce reserves further through the growth of other liabilities. In the Summary of Economic Projections (SEP) we look for: (1) a small downgrade to the median 2019 GDP growth projections; (2) a slight downgrade to the median NAIRU estimate; and (3) a new median policy path of no hikes in 2019, 1 hike in 2020, and no hikes in 2021 (down from 2-1-0 in the December SEP). 08:30 AM Philadelphia Fed manufacturing index, March (GS +1.0, consensus +6.0, last -4.1): After a 21.1pt decline in February, we estimate that the Philadelphia Fed manufacturing index rebounded by 5.1pt to +1.0 in March. 08:30 AM Initial jobless claims, week ended March 16 (GS 225k, consensus 225k, last 229k); Continuing jobless claims, week ended March 9 (consensus 1,748k, last 1,776k): We estimate jobless claims declined by 4k to 225k in the week ended March 16. Claims look somewhat elevated in Illinois, suggesting scope for mean reversion. The claims reports of recent weeks suggest that the pace of layoffs remains low, though it probably remains somewhat higher than in early fall. 10:00 AM Existing home sales, February (GS +5.0%, consensus +3.2%, last -1.2%): After a decline in January, we estimate that existing home sales increased by 5.0% in February based on stronger regional sales data. Existing home sales are an input into the brokers' commissions component of residential investment in the GDP report.